Welcome to the grand John R. Lawrence Estate, one of the most beloved homes in Cream Ridge, Upper Freehold Twp. 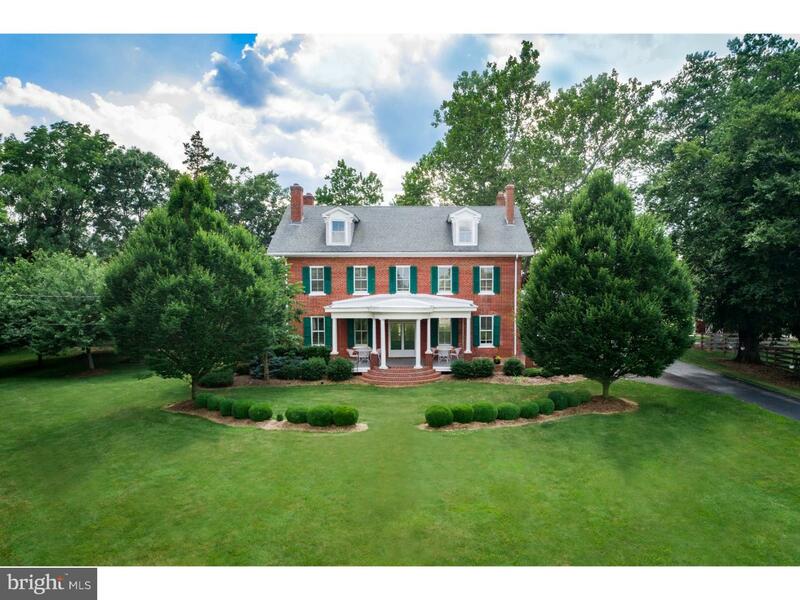 Steeped in history, this circa 1795 federal style brick estate is eligible for The National Register of Historic Homes and spans 11.03 acres of picturesque assessed and preserved farmland. Set back off the road with white picket fencing, manicured landscaping and a tree-lined drive, the stately columned front porch and brick facade recalls Old World charm and elegance. Enter the double doors into the impressive center hall with its wide planked chestnut floors, detailed hand-painted mural and grand staircase. To the left is an elegant double parlor, with soaring 10'ceilings, 6'double hung windows and 2 beautiful vintage marble fireplaces,just 2 of 6 fireplaces in the home. To the right is the formal dining room with the original oak mirrored mantle. Double pocket doors open to the library showcasing custom built-in cherry bookcases. The spacious gourmet kitchen is ideal for entertaining with built-in Miele appliances, granite countertops, custom cabinetry, a center island and a back staircase. Enjoy stunning views of the rear pastures and stables from the back patio terrace. Just inside is a mudroom with a full bath to rinse off after an active day. The second floor features 5 tastefully restored bedrooms and a charming hall bath with vintage stained glass windows, tongue & groove walls/ceiling and original 6' clawfoot soaking tub. The Owners suite boasts a dressing area with new flooring and a built-in closet system, a full-sized washer/dryer, a full bath with a jetted spa tub & stall shower. The walk-up attic provides 10' ceilings for additional storage. The high efficiency boiler w/6 zone heat,2 zone AC, generator hookup, wine room & additional storage rooms are in the full walk-out basement. This 11+ acre Gentleman's farm contains a beautiful 4-stall horse barn, over 5+ acres of newly fenced paddocks, open fields/riding trails, several no-freeze water hydrant/spigots, raised garden beds, double sided corn crib, 4 run-ins, garden/workshop and even the original outhouse. A massive 92X40 Morton pole barn can accommodate large farm equipment, rec.vehicles or a possible indoor area. The oversized 2-car garage has heat/ac with gym/office above. Ground-mounted 10KW Solar Panels provide electricity & credits. 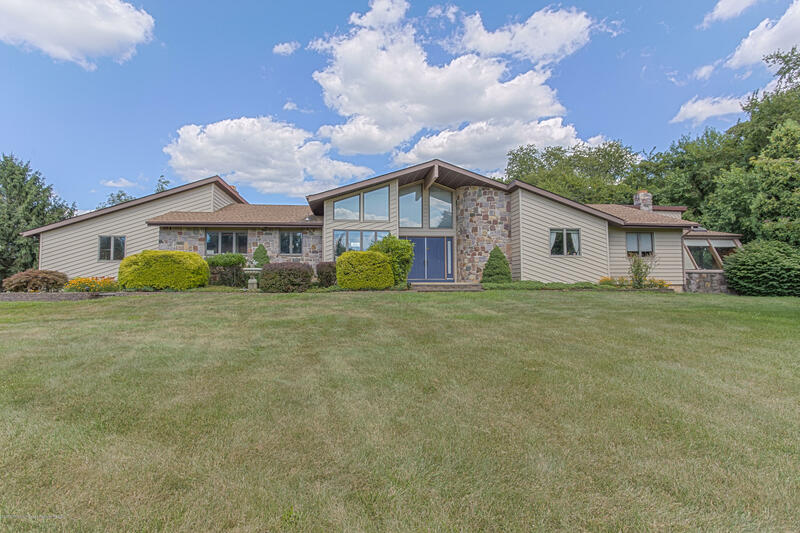 Close to NJTP,195, Horse Park of NJ/Trans-Union Trail, Cream Ridge Winery, shopping & great Upper Freehold Schools. Call today for a tour! Beautiful Exquisite Equestrian Property in the Cream Ridge that has and offers all you can ever want and lots more. An amazing 22 acre property farm assessed but not in or part of farmland preservation. Completely gated and fenced in property with an asphalt driveway and parking area. Enter this beauty through eye catching wrought iron gates and down a long asphalt driveway. As you continue to walk the property you will find yourself with a 3/4 acre fully stocked fishing pond with a water fountain in the middle and a gazebo on the pond's edge in a romantic setting for those clear sky nights. From the pond you can make your way down a park trail over a concrete bridge and enjoy a beautiful meadow and the wildlife that it attracts.